Day 29 – Sweet goodbyes. One day, a couple weeks back, Sneaky elf went to school. Caleb was amazed and thrilled when Sneaky turned up in the hood of the classroom aid’s hoodie sweatshirt. It just so happened to be Caleb’s day to share at morning meeting. What a coincidence! Caleb’s classmates, who had been hearing lots of stories about Sneaky, were very excited to get to meet him in person. Since today was the last day of school before Sneaky will head back to the North Pole until next Christmas, Sneaky decided to send some small treats and holiday wishes to his new friends. I’m really, really grateful to Sneaky for stepping up and handling this task because I hadn’t given any thought to treats for C’s classmates yet and time was up. 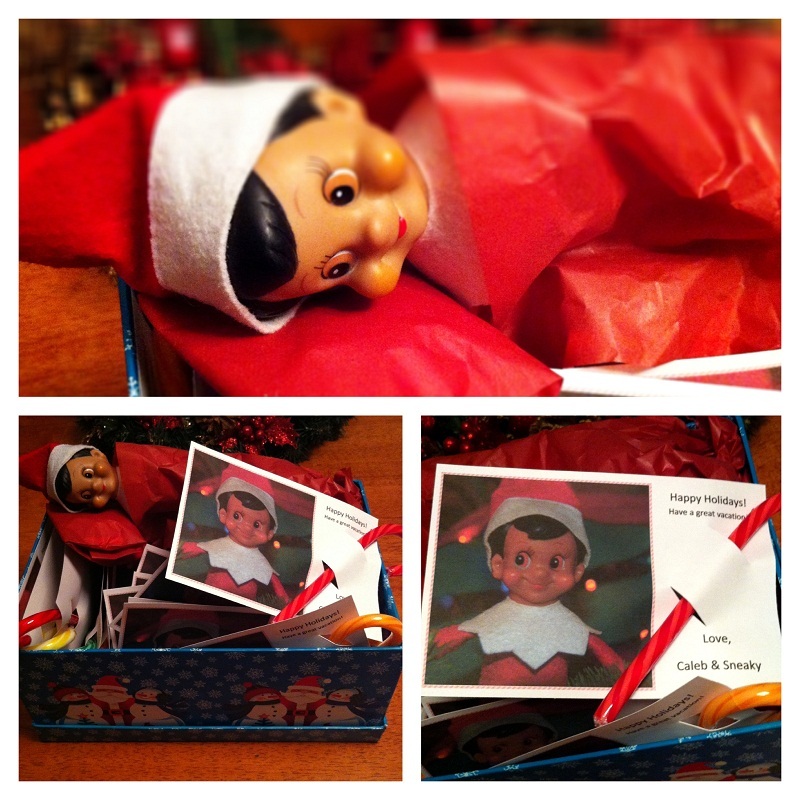 Poor Sneaky fell asleep in the box after he finished the last card…that’s what happens when you stay up to 2AM you silly elf! ← Day 28 – Wheee! Lorraine Cole Burr liked this on Facebook. You are the BEST mom! Lucky Caleb.